Buckland's Complete Book of Witchcraft has influenced and guided countless students, coven initiates, and solitaries around the world. One of modern Wicca's most recommended books, this comprehensive text features a step-by-step course in Witchcraft, with photographs and illustrations, rituals, beliefs, history, and lore, as well as instruction in spellwork, divination, herbalism, healing, channeling, dreamwork, sabbats, esbats, covens, and solitary practice. The workbook format includes exam questions at the end of each lesson, so you can build a permanent record of your spiritual and magical training. This complete self-study course in modern Wicca is a treasured classic—an essential and trusted guide that belongs in every Witch's library. 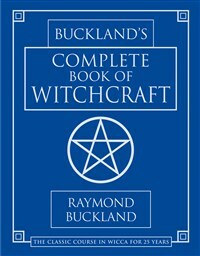 Raymond Buckland was actively involved in metaphysics and the occult for fifty years. He was the author of more than sixty books, including such best-selling titles as Buckland's Complete Book of Witchcraft, Gypsy Dream Dictionary, Practical Candleburning Rituals, and Witchcraft from the Inside. Ray lectured and presented workshops across the United States, and appeared on major television and radio shows nationally and internationally. He also wrote screen plays, was a technical advisor for films, and appeared in films and videos. Ray came from an English Romany (Gypsy) family and resided with his wife Tara on a small farm in central Ohio. Beyond writing, Ray's other passion was homebuilt airplanes.